Voted Best Burger, Top 10 Burger Joint and a Must Do in Central Florida amongst other countless recognitions, “Everyone’s neighborhood grill” Teak Neighborhood Grill announces the launch of a new menu featuring numerous exciting, innovative and delectable dishes made fresh daily to add to Teak’s already renowned menu items, which has made this Metrowest community hot spot a favorite amongst foodies, locals and visitors near and far. Just in time for football season, Teak’s new menu welcomes five more original burgers, three sandwiches, two desserts and several starters and salads sure to satisfy everyone’s taste buds. Teak is open for lunch, dinner, happy hour and now Saturday and Sunday brunch and serves a full menu daily until 2am. Experience Teak at 6400 Time Square Ave, Orlando, FL 32835. 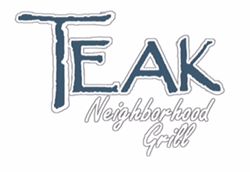 For more information, menus, weekly specials and more, visit http://www.teakorlando.com, http://www.facebook.com/teakorlando or call 407-313-5111.